Coping with Ichthyosis: 14072015: Amazing shower scrubs! I found these tubs of bath salts on a local Malaysian online shop on Instagram. I decided to give them a try! My first purchase was the Detox scrub which is black in coal due to the coal content. Bought it because the reviews were really great with photographic proofs. works excellent for removing scaly skin. there is no need to scrub! I used to think I can't live without lotion. I bring these tubs everywhere with me! Sometimes the detox and other times the dry away. Contact freshop_malaysia if you're residing in Malaysia. If you're overseas and would really like to try these, contact me. They are all homemade with natural ingredients. My skin is very very sensitive towards soap. Anything soapy or contains antibacterial properties, it will start becoming reddish and peels. 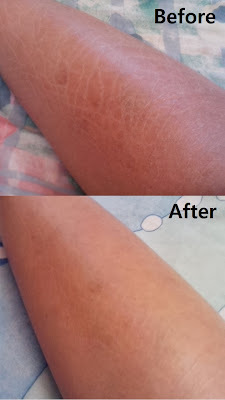 This was my skin condition before and after shaving, which I posted in this post questioning whether shaving helps: http://copingwithichthyosis.blogspot.com/2014/02/does-shaving-helps-skin-shed.html. But you can't possibly shave everyday and this only happens when I shave after a very longgg time. It's the most effective, natural and no side effects product I've tried so far. Now! Big difference? What's more amazing, no lotion! just sharing what really works and since it's so cheap (RM29 = less than 8USD?!) it's worth the try! These are my 3rd purchase!! Hi, meilin. I'm Della from Indonesia. My IV has been showing since around 6, i dont remember exactly when. I just knew the skin disease this past years from a dermatologist. He prescribe me a lotion : salicylic acid and urea. I used it for around 5 years. It's really good. My skin looks better. I still have scaly skin anyway. But it doesnt feel dry and the scales isn't too visible. But, recently the formula doesn't work like usual. It becomes watery and smells sooo bad. My skin doesn't feel better at all. I stop using it. And my skin becomes REALLY DRY and itchy. My skin at worst condition in my life. I found vaseline intensive care and give a try. I've been using it for several days. So far, i love it. I have read all of your blog post and interested to try this scrub.